Some say that gardens planted under mature trees are a bad idea, always doomed to fail. At face value, the design does seem to have many challenges: the tree canopy prevents sun from reaching the flowers, and the addition of soil around the base of the tree may smother roots. Yet, homeowners never stop striving for those elusive healthy flowerbeds under their trees. A quick observation of the understory of a forest will tell you that yes, it is possible to grow a healthy stand of plants under a tree. Balance the needs of the tree with the flowers beneath, and you can achieve a thriving shade garden where there was once only spindly grass and hard packed dirt. Which Trees are Flower Garden Compatible? Although a mature shade tree may appear to be unyielding, the root system that lies just beneath the soil tells a different story. Most people are familiar with the large tree roots that anchor the tree to the ground, resembling a network of upside down branches. However, the majority of the life-giving roots on a tree are much finer: think of capillaries compared to the aorta. These fine roots are key in delivering moisture and nutrients to the tree, and disturbing them too much can weaken a tree, leaving it vulnerable to pests or unfavorable weather. In fact, the tree you see dying today may have begun its downward spiral several years earlier. If all of this sounds concerning, rest assured that not all trees are created equal in the amount of root disturbance they will tolerate. Some common landscape trees that don't mind sharing their real estate include crab apples, willows, ginkgoes, and poplars. On the other hand, trees like pines, sugar maples, beeches, dogwoods, and oaks do not like gardeners poking around their root systems. You don't have to choose between flowers and trees if you have these in your garden; consider installing some flowering containers around the base of these trees. A final important consideration when planning a flowerbed under a tree is whether or not the tree has allelopathic qualities. This refers to the phenomenon of a tree or plant releasing metabolites that inhibit the growth of other plants. These chemicals protect the tree's turf, decreasing competition from other plants. Walnut trees are a classic example, as anyone who has ever tried to grow an azalea around a walnut can tell you. Other trees that don't play well with landscape plants include eucalyptus and hackberry. Once again, flowering containers can provide a solution here. Once you've determined that your tree can tolerate some companion plants, you must find flowers that will put up with the shade and reduced moisture and nutrients found in the soil around a tree's understory. Flowers that will grow in dry shade have the best chance of surviving or even thriving, followed by shade-loving flowers that have greater irrigation needs. Sun-loving flowers, like those seen in your typical cottage garden, have the worst chance. Who hasn't wanted to dig up and kidnap a gangly rose straining for a few rays of sunlight beneath a towering oak? Flowering plants with a proven track record in dry shade include lady's mantle, Peruvian lily, columbine, begonia, clarkia, foxglove, ajuga, hellebore, 'Annabelle' hydrangea, and nicotiana. Are any of your favorites on this list? If not, you can take your chances with some needier shade-loving flowers like impatiens or ageratum. 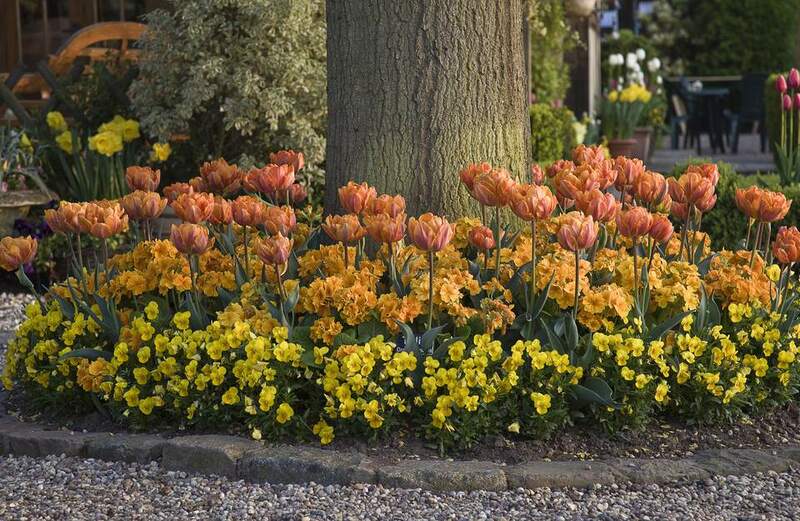 Another winning strategy for growing flowers under trees is to plant those with a short spring life-cycle, such as the combination of tulips, primroses, and pansies pictured in this article. By the time the tree has fully leafed out, the flowers are done, and you can pull the spent plants in the case of the pansies, or leave the bulbs in place to enter summer dormancy. When you've decided upon the best flowers to plant under your trees, choose small transplants that you can easily tuck around tree roots. Water the small root balls frequently, as trees not only take up huge amounts of water from the soil, their canopies also prevent rainfall from reaching your new plants. A two-inch layer of organic mulch will help to reduce stress on the new plants, without denying oxygen to tree roots. If any of the new plants fail, camouflage the blank spot with a fairy garden accent or birdbath, and no one will be the wiser.